1. the formation, usually by scarring, of a small depression. 2. the removal from erythrocytes, by the spleen, of such structures as iron granules, without destruction of the cells. 3. remaining indented for a few minutes after removal of firm finger pressure, distinguishing fluid edema (pitting edema) from myxedema. The amount of pitting serves as an assessment of severity and is graded on a numerical scale (see accompanying table). In dentistry, the formation of well defined, relatively deep depressions in a surface, usually used in describing defects in surfaces (often golds, solder joints, or amalgam). It may arise from a variety of causes, although the clinical occurrence is often associated with corrosion. See also: pitting edema, nail pits. 3. remaining indented for a few minutes after removal of firm finger pressure, distinguishing fluid edema from myxedema. 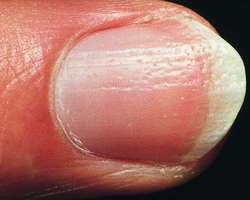 1 small, punctate indentations in fingernails or toenails, often a result of psoriasis. 2 an indentation that remains for a short time after pressing edematous skin with a finger. 3 small depressed scars in the skin or other organ of the body. 4 the removal by the spleen of material from within erythrocytes without damage to the cells. dentistry The formation of well-defined, relatively deep depressions in a surface, usually used in describing defects in surfaces (often gold, solder joints, or amalgam). It may arise from a variety of causes, although the clinical occurrence is often associated with corrosion. In dentistry, formation of well-defined, relatively deep depressions in a surface, usually used in describing defects in surfaces (often golds, solder joints, or amalgam). 3. remaining indented for a few minutes after removal of firm-finger-pressure, distinguishing fluid edema from myxedema. Frankel, Pitting Corrosion of Metals: A Review of the Critical Factors, J. The stress corrosion phenomenon is dangerous because crack growth rate is bigger than in general or pitting corrosion cases. Pitting corrosion behavior of 3161 stainless steel in the media of sulphate-reducing and iron-oxidizing bacteria. TABLE 1 Pitting corrosion Frequency Percent Minimal 1 10. Chloride ions, on the other hand, are aggressive to the steel reinforcement causing pitting corrosion and may penetrate through concrete. Pitting corrosion can be prevented by the action of adsorptive organic inhibitors which prevent the adsorption of the aggressive anions or by the formation of more resistant oxide film on the Al metal surface. Pitting corrosion is a form of extremely localized corrosion that leads to the creation of small holes in the metal. In other cases, pitting corrosion occurs after a few years of storage in low quality water, which lead to the release of radioactivity to a storage pool [6, 7]. Localized corrosion attack in an otherwise resistant surface produces pitting corrosion. Past studies reveal that Al composites suffer localized pitting corrosion in chloride ion environment compared to other media [13-15]. Pitting corrosion is a localized form of corrosion where the bulk material may remain passive, but pits or holes in the metal surface suffer localized and rapid surface degradation (FIGURE 3). Molybdenum is added to decrease the thermal coefficient of expansion and improves resistance against pitting corrosion and forms oxides on the alloy surfaces.